Dallas based and American-owned, McFall Masonry & Construction has been serving customers since 1979. 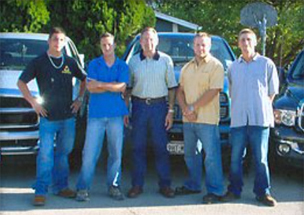 We employ only English-speaking crew leaders and have been family owned since inception. Family means the world to us and that is how we treat each and every one of our customers! Concrete Services: Patios, Driveways, Walkways, Porches, Steps & Interior Floors. Stonework: Brickwork and Stonework from Flower Planters & Borders to Commercial Buildings Using Bricks, Flagstone, Marble, Granite, Travertine and Limestone. Outdoor Kitchens, Fireplaces & BBQ’s: Firebox Construction, Built-in Grills & Stone Sitting Areas. Repairs of Stone, Concrete & Brick: Simple Mortar & Crack Repairs to the Strengthening of Walls, Ties, Archways & Fences. Retaining Walls: Rock, Stone, Brick, Concrete, Pavestone & Block. Walls from 1’ to 25’ plus. 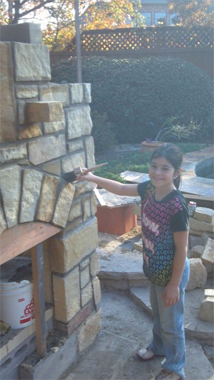 Custom Masonry: Chimneys, Piers, Foundations, Ponds, Fountains, Porches, Walkways, Planters, Tree Wells & more! Drainage: Avoid excessive moisture on your property. McFall Masonry offers drainage systems so this is never a problem. Patio Covers: Compliment your home by expanding your outdoor living area with a wood patio cover. Arbors: McFall Masonry is the ultimate source for arbors of every size, finish, style, and material. Decks: Add value to your home and enjoy your yard with our custom deck designs. Fencing: Beautify and protect your property with our many fencing options. McFall Masonry & Construction has always embraced three core principles: quality workmanship, quality materials and reasonable pricing. Consequently, we are well known for reliability and value. All of our work is backed by a comprehensive workmanship warranty. Completing over 75 jobs a year, we are committed to the highest levels of personal and professional integrity. We meet our customer’s needs and expectations consistently. From estimating and the bid process to the final completion of your project, we will keep our word, do what’s right and build a relationship with you that will last a lifetime. Our crew will stay on your job until you are 100% satisfied. You can count on tenacious attention to detail and pride of accomplishment. We have accumulated a list of many satisfied customers and encourage you to browse our testimonials page. We believe you will be delighted with our work. We always endeavor to exceed the expectations of our customers and we are dedicated to delivering maximum return on their investments. We take joy in demonstrating the unequaled value, beauty, flexibility and permanence of masonry. We act with absolute honesty, integrity and fairness in our business dealings. McFall Masonry & Construction is all about relationships. Building and maintaining solid relationships with our customers, vendors and employees is a major goal of our company. Being true to our word, keeping our commitments and caring about our people and the jobs that they do, will always be our first priority. Built on integrity, McFall Masonry & Construction strives to treat all employees, subcontractors and clients as we would like to be treated. We embrace the values of honesty, hard work and service. Contact us today for more information about McFall Masonry & Construction and to schedule a free design consultation where we can discuss your project!